Lava cascades down the slopes of Mayon volcano as seen from Legazpi city, Albay province, around 340 kilometers (210 miles) southeast of Manila, Philippines, Jan. 15, 2018. The Philippine Institute of Volcanology and Seismology said Tuesday morning the lava was quietly flowing in some places but at times Mount Mayon was erupting like a fountain. Lava had advanced up to 2 kilometers (1.24 miles) from the crater, and ash was falling nearby. 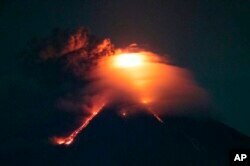 Lava cascades down the slopes of Mayon volcano as seen from Legazpi city, Albay province, around 340 kilometers (210 miles) southeast of Manila, Philippines, Monday, Jan. 15, 2018. Nearly 15,000 people have fled the danger zone already. The alert level remained three on a scale of five, indicating an increased prospect of a hazardous eruption "within weeks or even days." Mayon lies in Albay province about 340 kilometers (210 miles) southeast of Manila. It has erupted about 50 times in the last 500 years, sometimes violently. Five climbers died in 2013.